Ernie Cruz Jr. was born in Honolulu and raised in Pālolo Valley, ahupuaʻa of Waikīkī, in the moku of Kona where he graduated from Kaimukī High School. 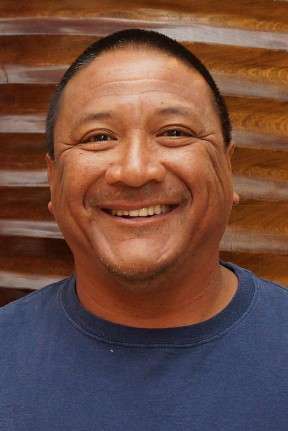 In Pālolo, he grew up as an “urban Hawaiian” but developed strong ties to the ocean and connections with the surfing community in his youth. Ernie currently works at McCabe, Hamilton and Renny as a stevedore and is a highly accomplished and respected Hawaiian musician. Born into a musical family, Ernie has deep roots in Hawaiian and Blue grass music. He first entered the music scene as a member of the popular and highly influential Kaʻau Crater Boys where he gained extensive experience touring around the state, nation, and internationally. Ernie later earned a strong reputation when he ventured out on his own and released his solo-album “Portraits” in 2001, an album which highlighted his virtuosity and social conscience. The album went on to garner him male vocalist and island contemporary album of the year at the 2002 Na Hoku Hanohano awards. Ernie has since generously shared the microphone and stage with local and national acts playing comfortably in both the backyard and the Waikīkī Shell. Through his musical career and family experience Ernie has long respected, supported and learned from the long standing and growing impact of the Hawaiian renaissance that came to fruition in his youth. He sees this movement further boosted by the work of KUA, especially in regards to empowering and increasing the influence of the traditional and sustainable values and ways that are retained in Hawaiʻi’s rural communities. Ernie hopes his unique skills, experience and world outlook will contribute to our communities’ desires to deepen roots, spread wings and achieve ‘āina momona.